Craftsman is a line of tools, lawn and garden equipment, and work wear. Originally owned by Sears, the brand is now controlled by Stanley Black & Decker. Craftsman tools were first sold in 1927. They were not manufactured by Sears, but by various other companies under contract. The tools were sold in Sears, sister retailer Kmart, and several other retailers. In March 2017, Stanley Black & Decker acquired the Craftsman brand from Sears Holdings and Sears kept a limited license for Craftsman products. Sears maintains the right to manufacture and sell tools using existing supply channels under the Craftsman name for 15 years after the deal closed. In April 2018, Lowe's began selling Craftsman tools. The Craftsman trademark was registered by Sears on May 20, 1927. Arthur Barrows, head of the company's hardware department, liked the name Craftsman and reportedly bought the rights to use it from the Marion-Craftsman Tool Company for $500. The brand's early customers were mostly farmers. Barrows' successor, Tom Dunlap, upgraded the quality of the tools and added chrome plating to them as America moved into the automobile age. Sears' tool line, like many of its other product lines, uses a "good, better, best" pricing structure, with the "Craftsman" brand as the middle tier and "Craftsman Professional" or "Craftsman Industrial" as the highest tier. Craftsman Professional and Craftsman Industrial are marketed as being comparable to brands like Cornwell Quality Tools, SK, Snap on, Proto, Mac, and Matco. The standard Craftsman line is marketed as being comparable in quality to other mid-price brands including UltraPro (NAPA), Westward, Gray, Husky, and Kobalt. Sears also marketed a "Sears Best" line of hand tools for a time. The lowest tier was originally branded "Sears". The company also used the "Dunlap" name for its lesser quality tools from the late 1930s until the late 1950s. The Sears tool line was discontinued in the late 1980s and replaced by the "Companion" tool line. The Companion tool line was itself discontinued and replaced by the "Evolv" tool line in 2008, with a focus on homeowners and DIYers. Evolv tools also have a lifetime warranty but require that the customer have the original dated receipt to make a claim. Since 1991, Sears has run the Craftsman Club customer loyalty program, one of the oldest such programs by a retailer. On January 5, 2017, Stanley Black & Decker announced its intent to acquire the Craftsman brand in a deal with a total value of $900 million (with an up-front payment of $525 million, and a payment of $250 million after three years). Sears will hold a royalty-free license to the Craftsman brand for a 15-year period after the completion of the sale, and will receive a royalty on all new Craftsman sales over this period. Afterwards, Sears will pay Stanley Black & Decker a 3% licensing fee. The deal was closed on March 9, 2017. Sears maintains the right to manufacture and sell tools using existing supply channels under the Craftsman name for 15 years. Sears has never manufactured Craftsman products itself, instead relying on other manufacturers to make the products for them following Sears designs and specifications, and then applying the Craftsman brand name. Sometimes, the Craftsman branded items include exclusive features or functions that separate them from the manufacturer's own brand or other brands that the manufacturer produces. 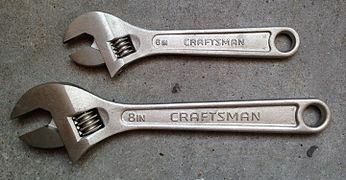 At other times, Craftsman products are identical to models of other brands with a different name on them. The hardline mechanic's tools (wrenches, ratchets, and sockets) that make up the core of the brand have been made by a variety of manufacturers over the years, including New Britain, Moore Drop Forging, Stanley, Easco Hand Tools, Danaher Corporation, and most recently Apex Tool Group. Screwdrivers have been manufactured by Pratt-Read and Western Forge, but are now supplied mostly exclusively by Western Forge, who also supply pliers and adjustable wrenches. Beginning in 2010, hand tools manufactured for Craftsman by Apex Tool Group (formerly known as Danaher) such as ratchets, sockets, and wrenches began to be sourced overseas (mainly in China, although some are produced in Taiwan), while tools produced for Craftsman by Western Forge such as adjustable wrenches, screwdrivers, pliers and larger mechanic tool sets remain made in the United States, although as of 2018, most if not all of the production for these products have moved over to Asia. Sears still has an Industrial line which is sold through various authorized distributors. These tools are US made, appearing identical to their previous non-industrial US made counterparts, save for the "Industrial" name stamped on them. They are manufactured by Apex on the US production lines that previously produced the USA made standard Craftsman product before production switched overseas to Asia. Many Craftsman portable power tools have been manufactured by Techtronic Industries. Previously, these products were produced by the Diehl Motor Company (a one time division of Singer) and Ryobi. Both Singer and Ryobi have been condensed under the Techtronic company umbrella. These tools had a "315" or "973" prefix. Most of the "315" product was made in the United States. Sears hand power tools have also been produced by DeWalt. These tools will typically have a "900" model prefix. Some, such as the corded and cordless drills, were indistinguishable, other than the color and decal labels. Many Craftsman bench and stationary power tools have been manufactured by Emerson Electric Company under the "113" model prefix (previously under the "103" model prefix which was King-Seeley, but Emerson bought them out in the 1960's) and DeWalt. Air compressors were manufactured by DeVilbiss Air Power (part of Dewalt), and formerly by Campbell Hausfeld. (DeVilbiss sourced units have a "919" model prefix and Campbell Hausfield had a "106" model prefix). Tool storage has typically been manufactured by Waterloo Industries,("706" model prefix) while Craftsman-branded garage door openers are manufactured by The Chamberlain Group ("139" model prefix). Hammers have been produced by Vaughan-Bushnell for Sears. (Coded "M" on the tool). Many of the automotive specialty tools such as feeler gauges and gap gauges have been made by A&E Tool Company of Racine, WI (these tools will have an "S" logo in a circle). Ullman Devices of Ridgefield, CT makes many of the magnetic pick up tools, picks and inspection mirrors for Sears. Some tools have codes on them that correspond to the manufacturer that produced the product for Sears (see Alloy Artifacts website reference below). For example, on hand tools, codes on them will indicate who made them for Sears. For example, Western Forge sourced tools will have a "WF" stamped on the tool. Tools produced by Moore Drop Forge will have a "V" on them, tools from Pratt-Reed will have "PR" on them, Easco will have an "E" or "EE", and later Danaher made tools (USA made) will have a "VV" or a "VɅ" (inverted second "V"). Pliers have been sourced by a few vendors including the aforementioned Western Forge "WF" tools and Wilde Industries which have a "P" on the tool. Some sockets (notably the 3/4 drive USA made units) were made by S-K (coded "X" on the tool). Many major Sears Craftsman items as noted above also have a vendor prefix, which is typically the first three digits before the period or dash in the model number. These first three digits correspond to the vendor code, or the actual manufacturer contracted to make the product for Sears. In 2007, a Harris Interactive poll gave Craftsman the highest score for both "Brand Expectations" and "Trust". In 2009, the readers of Popular Mechanics named Craftsman their favorite brand of hand tools in their Reader's Choice Awards. Craftsman is the official tool brand of NASCAR and the DIY Network. Most Craftsman hand tools are advertised as having an unlimited lifetime warranty. This lifetime warranty program was instituted by Sears when they began selling the Craftsman line in 1927. This warranty program requires no receipt or dated proof of purchase. If the owner takes the item into a local retail store, it may be replaced or repaired free of charge. In some cases, such as ratchets, the customer may be offered a repair kit with which to repair the item or an already refurbished item. As of 2017, many Sears stores do not offer the kits to consumers; instead, they will either rebuild the customer's ratchet or provide one that they have already rebuilt. Ratchet kits for the US made ratchets are different than those for the Asian made ratchets, although some repair kits for the US made ratchets are now made in China (but again, will not interchange with the kits for the Asian ratchets). As of 2018, some stores will supply the customer the rebuild kits for them to rebuild on their own, while others will require the customer to have the store employees rebuild the ratchet for them. If for any reason your Craftsman hand tool ever fails to provide complete satisfaction, return it to any Sears store or other Craftsman outlet in the United States for free repair or replacement. This warranty gives you specific legal rights and you may also have other rights which vary from state to state. Sears has reduced the warranty in effect on many Craftsman non-powered lawn and garden products including rakes, shovels, clippers, brooms, trowels, pruners, hoses, sprinklers, hose nozzles, and other small gardening hand tools. Previously it was a lifetime warranty which on August 2, 2012, was reduced to 25 years with receipt required. The lifetime warranty does not include precision hand tools, such as calipers and torque wrenches. Many consumers have also been reporting problems when attempting to obtain warranty repair or replacement on tools that are covered by the full lifetime warranty. Sears' official position is that the warranty should be honored, and much of the problem may lie with individual sales associates. In some cases Sears no longer sells particular Craftsman tools (tape measures, and wood clamps are two examples), making it impossible to replace a tool sold with a lifetime warranty with a similar Craftsman tool that will continue the warranty. Some Sears stores limit the number of hand tools that can be exchanged per day, in an effort to reduce the abuse of the lifetime warranty. Stanley Black & Decker has stated that all previous warranties on Craftsman products will be honored after the purchase of Craftsman in 2017. Some of the newer packaging (as of 2018 onward) on some Craftsman products does indicate that there may be a limit on returning warranty tools. As of February 2019, the "non-Sears" Craftsman does not have "open stock" in the stores as Sears does to replace individual items from a set that may require warranty. Stanley Black and Decker has indicated that they are working on introducing more individual tools to stores. Power tools have a one-year warranty. Craftsman tools came under fire in 2004 in a lawsuit accusing Sears of false advertising and consumer fraud for questionable use of the slogan "Made in the USA". From 1995 to 2008, Craftsman sponsored the NASCAR Craftsman Truck Series, a deal which began with the inception of the Truck Series. After the 2008 season, Craftsman withdrew from sponsoring the series and was replaced by Camping World. In 2016, Craftsman returned to motorsports sponsorship, serving as the title name for the World of Outlaws, renaming the Sprint Car Series and Late Model Series to the World of Outlaws Craftsman Sprint Car Series and World of Outlaws Craftsman Late Model Series, respectively. In 2018, Craftsman returned to NASCAR to sponsor Erik Jones and Ryan Preece in a few races, in 2019, Craftsman will return to sponsor Erik Jones. The main licencees for Craftsman in the UK was Focus DIY and B&Q. B&Q began selling them in 2001 but Focus DIY began selling them in 1993. The main licensee for Craftsman in the rest of Europe was Robert Bosch GmbH and selling it at retailers and Amazon. ^ Miller, Ben (March 7, 2019). "Stanley sues Sears over Craftsman brand". Chicago Business Journal. Retrieved March 8, 2019. ^ a b "Craftsman at Lowe's: Now Available". Lowes.com. Archived from the original on April 14, 2018. Retrieved November 14, 2018. ^ a b "A Tool Industry Timeline". Alloy Artifacts. Retrieved September 25, 2016. ^ Sears Archives. "Craftsman: The Standard of Quality". Retrieved March 3, 2010. ^ a b Joslin, Jeff (December 15, 2010). "Craftsman - History". Old Wood-Working Machines. Archived from the original on December 20, 2010. Retrieved January 7, 2017. ^ Duff, Mike (April 8, 2009). "Sears, J.C. Penney Launch Post-Martha Home Collections". BNET. Retrieved April 6, 2010. ^ Manfer, Sam (April 6, 2010). "Good, Better, Best". Biz-Blog@SalesVantage. Retrieved April 6, 2010. ^ "Early Craftsman Tools and Their Makers". Retrieved April 6, 2010. ^ "Evolv trademark details". Boliven. Retrieved March 27, 2010. ^ Sears Holdings Corporation. "Evolv hand tool warranty". Archived from the original on February 18, 2009. Retrieved March 3, 2010. ^ "Sears and Craftsman(R) Introduce Craftsman Club Rewards" (Press release). Sears Holdings Corporation. August 6, 2009. Retrieved February 22, 2010. ^ "Sears to sell Craftsman tools at all Kmart stores". The Associated Press. September 14, 2006. Retrieved February 22, 2010. ^ "Circular Saw by Craftsman". Montgomery Ward. Retrieved December 29, 2016. ^ Merced, Michael J. De La (January 5, 2017). "Sears Agrees to Sell Craftsman to Stanley Black & Decker to Raise Cash" – via NYTimes.com. ^ "Stanley Black & Decker Completes Purchase Of Craftsman Brand From Sears Holdings" (Press release). Stanley Black & Decker. March 9, 2017. Retrieved March 14, 2017. ^ Laura Northrup (June 7, 2017). "Sears Settles With One Craftsman Supplier, Files New Lawsuit Against USA-Made Hand Tool Company". Consumerist. Retrieved June 10, 2017. ^ "Craftsman 'BE' and H-Circle Series Tools". Alloy Artifacts. Retrieved February 22, 2010. ^ Campbell, W. Joseph (October 15, 1988). "Stanley Earnings Grow 11% Despite Weak Construction Industry". The Hartford Courant. Retrieved February 22, 2010. ^ Sweeney, Paul (October 15, 1988). "Brothers Come of Age With New Bid". The New York Times. Retrieved February 22, 2010. ^ Schmidt, Joanna (June 25, 1992). "Western Forge employees celebrate honors from Sears/Company named best of 10,000 suppliers". Gazette Telegraph. Retrieved March 27, 2010. ^ "Hershey's Kisses Chocolate Candy Ranks No. 1 in Overall Brand Equity" (Press release). Harris Interactive. June 26, 2007. Retrieved February 22, 2010. ^ "Craftsman(R) Named Favorite Hand Tools in Popular Mechanics Reader's Choice Awards". Sears Holdings Corporation. July 2, 2009. Retrieved February 22, 2010. ^ "Craftsman(R) Tools: Now the Official Tools of DIY Network" (Press release). Sears Holdings Corporation. January 21, 2009. Retrieved February 19, 2010. ^ Lamb, Robert (January 18, 2001). "In search of the lifetime guarantee". USA Today. Retrieved March 3, 2010. ^ Sears, Roebuck & Co. "Why Craftsman?". Archived from the original on June 28, 2002. Retrieved June 28, 2002. ^ Cage, Chuck (August 8, 2006). "A Quick Comment on the Craftsman Lifetime Warranty". Toolmonger. Retrieved March 9, 2010. ^ a b Walters, Chris (March 25, 2009). "Sears Clarifies Craftsman Tools Warranty". The Consumerist. Retrieved February 19, 2010. ^ a b c "Warranty Information". Craftsman.com. Retrieved August 24, 2017. ^ Popken, Ben (March 19, 2007). "Clarification: Craftsman Lifetime Warranty Doesn't Apply To Rusty Tools". The Consumerist. Retrieved March 9, 2010. ^ "Suit Hits Sears Made In USA Claim". ConsumerAffairs.com. December 8, 2004. Retrieved October 22, 2008. ^ Schwarb, John (October 23, 2008). "Camping World to replace Craftsman as Truck Series sponsor". ESPN. Retrieved April 5, 2016. Wikimedia Commons has media related to Craftsman (tools). Alloy Artifacts: "Early Craftsman Tools and Their Makers"
Alloy Artifacts: "Craftsman Tools: Maker 'V' and the Modern Era"
Old Work-Working Machines: "Craftsman OEM List"